How do organisations learn? It is fairly uncontroversial to say that we, as individuals and organisations, learn from consequences. But what sort of consequences do we learn from? In professions with a protective purpose, such as safety management, the assumption seems to be that we learn from negative consequences. At least, those are the ones on which we focus our attention. I recently picked up an old classic, A Christmas Carol. The parallel struck me. Scrooge could be seen as an analogy for how we have come to see the organisation. In this narrative, organisations learn from failures past, present and future, and in doing so they see the errors of their ways, and improve as a result. That is more or less how Dickens’ story went, but the narrative does not ring true for organisations. The problem with our preoccupation with failure lies in two assumptions. The first assumption is that failures provide good system feedback. The second assumption is that organisations learn from failures. While there is some truth in these assumptions, they do not form a complete set. When things went wrong in the past, we had no foresight. We just went about our business and probably did the same kinds of things we normally did. We had no consciousness of our future selves, looking back, wondering “Why on earth did we do that?” and our goals and focus of attention were probably unremarkable at the time. Whatever we did, it probably made sense to us at the time, with the demand and pressures we were experiencing, with the goals we were balancing, with the resources we had, and with the constraints that affected our possibilities. We had probably done it before, and it probably worked then. And just as we had no consciousness of the future, in our daily work we have no real consciousness of the things that have been. Whatever your profession, when you are doing your job you are unlikely to be conscious of your or your colleagues’ past failures. Sure, you will know about them, but you are more likely to be focused on a goal and how to achieve it, not a failure and how to avoid it. In my own industry, most air traffic controllers would be aware of the typical mental trip hazards, but it doesn’t stop them tripping. In fact, if you focus on a negative and how to avoid it, you may well be more likely to do whatever it was that you did not want to do. This is certainly the case with controllers, who soon learn to focus on what to say, not what not to say. Appeals to be more careful, watch out or do better next time are rarely of much use in anything but the very short term. I learned some years ago to be wary of any casual use of photos of the aftermath of disasters – airplanes, trains, oil rigs, or anything else – in presentations to senior management or front-line staff. Not only are these scenes too remote from day-to-day work, they either seem to induce anger (“Do you think we don’t know? !“) or fear. Fear induces a need to escape the fear by the most efficient means; this does not usually involve level-headed discussions about risk. Discussions of these tragic, rare events must be had, but they must not be devalued to appeal to fear. When we point out the shadows of things that have been, we are just the messengers. But when messengers only brings bad news, they will never be popular. Failure feedback is partial – failures are rare and as a sole source of safety feedback they are not representative. On the other hand, if the messenger brings historical information about how a system has performed – including ordinary day-to-day work, failures and exceptionally good performance – then this is much more valuable. Organisations need feedback on safety, not just unsafety. 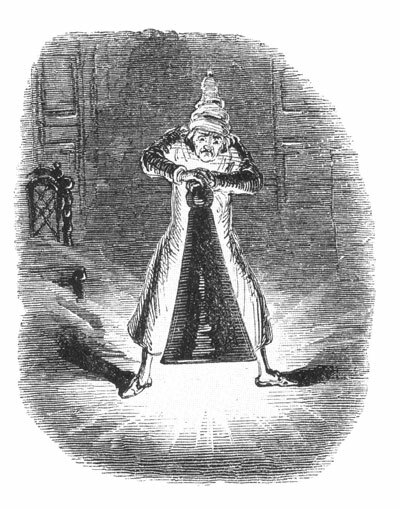 In the story, Scrooge is angered by the Ghost of Christmas Past, and extinguishes it with his cap. He finds himself back in his bedroom, where nothing has changed, not even the time on his clock. Many in safety management will empathise with the spirit. The present is something that we must look upon. That is when we have the chance and time to make performance adjustments to keep us on the right track. It is essential, then, to get timely data on how the system is functioning, how well the work is working. This is surely the best kind of safety data. But it is not the kind of data that we tend to use when it comes to safety management. If we do, again we focus on failure. And if all we can see are our failures, even in real-time, we are want to look away. Whenever you go into an organisation, try to get a sense of the perceived criticality of the safety management department to the organisation. This might be evident in various symbols such the organisational reporting lines, any safety materials, and the offices (locations, sizes, etc). It might also be evident in who attends senior management meetings, in how much the front-line staff interact with safety specialists, and how much safety is separate or integrated. When it comes to safety, it is a fantasy to think that organisations have the attitude that “if you have aught to teach me, let me profit by it”. In reality, no news from safety management is seen as good news, if – historically – the only news has been bad news. Ignorance precedes Doom. That is indeed a lesson for management, and safety management. But Ignorance is not just ignorance of risks, and Doom is not just an accident. Ignorance is also ignorance about how the system works on a day-to-day level, and Doom is doom in the form of all manifestations of organisational failure. By getting and integrating data of various kinds on how the system is working now, safety management can help organisations overcome ignorance, and so become much more valuable from a business perspective. We fear the failures yet to come the most, because of course they are unknown and unrealised, like the cloaked spectre in the story. The organisation’s defense mechanisms work to eradicate this fear, while in safety management we try to keep it alive. We try to make these failures knowable in our risk assessment activities. We like to think that these are objective tools, but they are far from this. They look objective and factual because the results are (often) expressed quantitatively and precisely. But the assumptions and conditions that underlie the data are far from objective and factual. The good intent behind risk assessment belies the fact that the result is nevertheless political and can be a constraint or obstacle to be overcome. The right answer will be received with a thankful heart. The wrong answer – not so. Risk assessment can be perceived as a threat to success when it only offers the possibility to impede organisational priorities. One possible solution to this, which has been integrated in some forms of risk assessment, is to look not only at failure, but also success, or to look at performance variability, which may be seen as the basis of success and failure. This is our hope, that organisations will live in the past, the present, and the future. It is a good aim. But knowledge only of the failures of past, present and future is not a good aim. We need to know how ordinary work might be changing over time. How does demand fluctuate over time? How do conditions change? How does performance vary over the short- and longer-term? For Scrooge, the tirade of negative feedback on his failures from the ghosts of Christmas past, present and future was enough to make him mend his ways. Not so with organisations. They continue to cry “Haunt me no longer!” when shown one shadow too many. If the focus is only on failure, organisations may well be happiest when they hear no news from the safety department. There are too many systemic and personal filters for bad news – especially on the way up the chain of command. But in the context of feedback on what is working – how routine work adapts to meet variation in demand and conditions – failure feedback becomes more credible, useful, and valuable. This entry was posted in Safety and tagged organisational culture, safety, safety culture, safety-I, safety-II, systems thinking. Bookmark the permalink.